May | 2013 | Charlene E. Hios "JD"
Did the Boy Scouts Make the Right Decision? 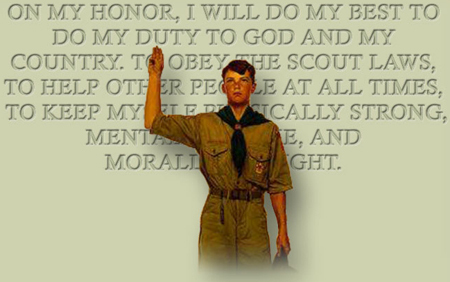 For me, the main thing to ponder upon is that these young boy scouts are still young and still impressionable . . . Right now, the culture they are in, basically, the world, is telling them that if you have same gender attractions you must be gay . . . But, we know this is not true, we know that young boys, will not mature until about age 25, right now the world is telling them they are gay because of their un-chosen attractions so they think they must be . . .
so, part of me sees the move as a positive one for the boys who want to be scouts who identify as gay . . . again, they probably have not acted out on the attractions, they just are identifying themselves as gay because that is what the culture is telling them . . . or if they have acted it out there is still hope they will not believe the lies that they are born gay . . .
so, if they get in with some strong men, the boy scout leaders, who are not gay, who are comfortable in their own skin, and their emotional needs are met by these leaders, basically I see gay identifying youth coming out with strong male identifies and no longer attracted to the same gender any longer . . .
the reason these young boys are identifying as gay is because they do have same gender attractions . . . and the culture tells them they are gay . . . but the real reason they have the attractions is because somewhere in their childhood their same gender parent did not meet an emotional need . . . now this emotional need that was not meet is not the same gender parent’s fault necessarily . . . it may be a matter of the child’s perception of it not being met . . . or it could have been something out of the hands of a predator . . . I see this whole thing as we see the story of Joseph being sold into slavery by his 11 brothers in the book of Genesis, in the Bible. What Joseph’s brothers intended for evil, God turned it around and used it for good, God used Joseph to save God’s people . . .
What gay activists intend for evil, a furtherance of their agenda, God can indeed turn around and use to bring these young boys back in line with God’s intended design.